Cill Ghobnait (St. Gobnait’s church) is sometimes referred to as “An Teampall Beag” (The Small Temple). It was probably built in the 11th century, although the site was in use since the 6th century. 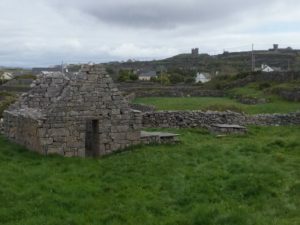 While in Inis Oírr, Gobnait lived in a corbelled roofed clochán (hermit’s beehive cell), the remains of which are located next to the church. These corbel roofed dry stone huts were often used as homes by early Christian monks. The clochán pre-dates the existing church, which is believed to have been built upon the site of another. Other interesting features are the 3 raised stone slabs (to the right of the church in the photo below). There are differing opinions as to their purpose, some say they are graves, altars or even penitence stones. The site has never been properly excavated, so the mystery remains!